Last week I volunteered to chair some sessions for the MIX: Writing Digital conference at Bath Spa University. The conference brought together a wonderful and eclectic mix of creative digital writing and trans-media publishing projects. As perhaps the only literary-critical scholar at the conference (and an eighteenth-centurist to boot), I was on the borders of a lot of the discussions taking place – enjoyable and intriguing though they were. It was perhaps this that led me to play around with my engagement with the conference. So below are some visualisations of the conference programme – in this case the programme also included bios of the delegates and abstracts of the presentations, so it’s reasonably representative of the conference’s themes . 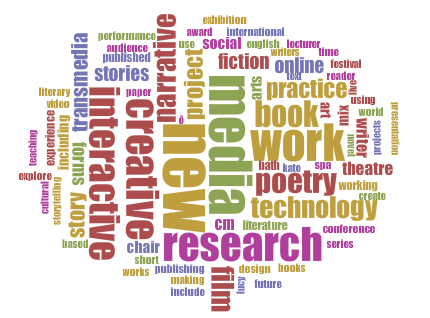 The first is a word-frequency analysis of the conference programme using Voyant Cirrus, but with some of the obvious large-frequency words – like ‘University’ ‘Writing’ and ‘Digital’ – edited out, a move that I think brings out some of the finer detail of the conference’s themes. 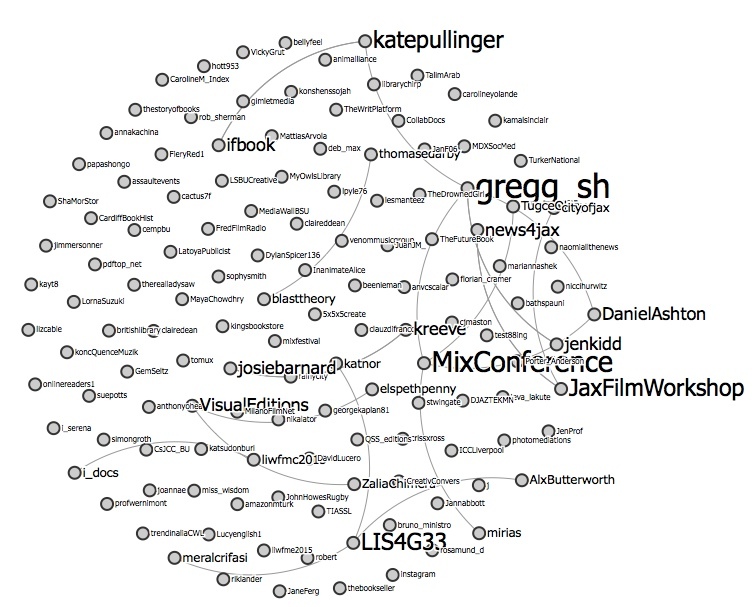 Finally, since I love tweeting during conferences, I put the conference hashtag through Mark Hawksey’s TAGS to produce a visualisation of the conference tweets (see above for the screen grab). Given so many of the projects and writings discussed during the conference were thinking through the possibilities offered by asychronous engagements with text, it seemed apposite that this kind of playing around with various analysers offered another way of engaging with the various texts of conference.